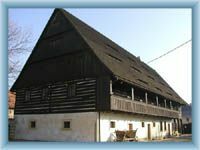 The town Kravare lies in West Bohemia between two big towns Litomerice and Ceska Lipa. It is also situated between the two beautiful places, the Ceske Stredohori upland and the national park Kokorinsko. Some larger ponds have been established there as well as recreational camps. There are tourist path leading through Kravare which are very pleasant. We recommend the one heading northward lengthways the Bobri stream. The pathway continues via the Bobri pass and ends by the waterfall. There is a hill Ronov nearby so we can visit it too with a ruin of the same name.